Since graduating as a Chiropractor 42+ years ago in 1976, Dr. Irving Pisarek received his Certification as a Fellow of the International Academy of Clinical Acupuncture (FIACA) in 1986, focusing on Laser Photo-Biostimulation. In 2004, he received his Certification for Needle Insertion Acupuncture, Level 1, Part 1, from the Acupuncture Foundation of Canada Institute in conjunction with the Continuing Education Department, Faculty of Medicine, University of Toronto. Unlike the insertion of needles utilized in traditional acupuncture, Dr. Pisarek at Advanced Healthcare employs Low-Level Laser Therapy (LLLT) also known as: photo-biomodulation therapy, laser acupuncture, 'cold' laser or soft laser. LLLT utilizes the precise and accurate, safe and painless application of helium/neon, red and near-infrared concentrated beams of focused light energy over 'Acupoints' (acupuncture points), injuries or wounds to enhance and accelerate improving soft tissue healing, reducing swelling and inflammation, relieving both acute and chronic pain, assisting with smoking cessation, enhancing weight loss and ultimately improving one's overall health. First developed over 30 years ago, LLLT uses a specific type of light to penetrate the skin's surface and underlying tissues to stimulate the body's natural repair processes. The result results in faster healing with reduced pain, swelling and inflammation. 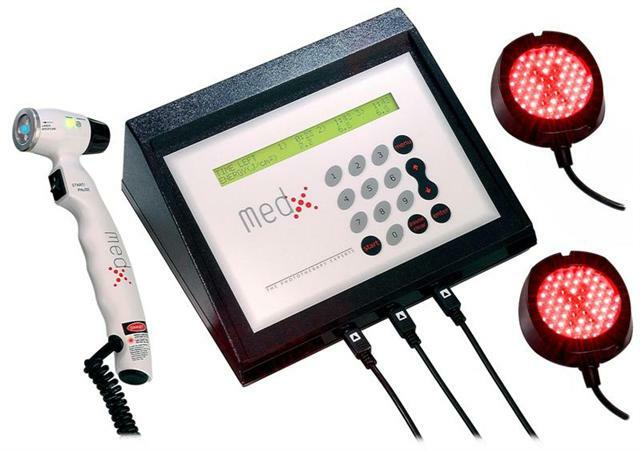 The MedX Laser is a Class 3b Laser, able to help improve quality of life for those who experience: pain; spine and joint conditions such as degenerative disc disease symptoms; arthritic conditions; certain neurological conditions such as arm pain and leg pain such as sciatica; car accident injuries, slip/trip and fall injuries, sport and work injuries; and many other rehabilitative conditions. Laser light therapy offers natural, effective, non-invasive, drug-free LLLT solutions that are FDA/CSA cleared and Health Canada licensed. Applying light produced by low level laser and super luminous diodes, triggers normal cellular functions that lead to faster wound healing, pain relief and accelerated functional recovery. MedX LLLT has been used successfully to treat athletic injuries, acute & chronic conditions, repetitive strain disorders, tissue healing and much more. By providing the extra energy required for healing on a cellular level, the tissue is able to heal itself naturally. This innovative therapeutic alternative may also eliminate the need for painful, debilitating surgeries and drug therapies so often accompanied by harmful side effects. New techniques and devices have been developed to use light as part of the healing process. Referred to as low level laser therapy (LLLT) or photo-biomodulation representing an umbrella term that can include light from low level lasers as well as super luminous diodes, also known as light emitting diodes (LED'S). Low level lasers are compressed light forms and are different from natural light in that it is one precise colour. Lasers are coherent waves, synchronized, and monochromatic (a single wavelength). Therapeutic light energy can be produced by Low Level Laser Diodes (LLLD) and/or Super luminous Diodes (SLD). These diodes can be within the visible red to the near infrared and infrared electromagnetic spectrum. These properties allow laser light (Class III) to penetrate the surface of the skin with no heating effect, no damage to the skin and no known side effects. Specific wavelengths and power levels result in different levels of penetration and cellular effects for treating a multitude of health conditions. There are two types of medical lasers: high power and low power. High power lasers are used to cut through tissue. Low-level lasers, on the other hand and which is used at Advanced Healthcare, are used to stimulate tissue repair through a process of photo bio-stimulation. The word "laser" is an acronym for 'Light Amplification by the Stimulated Emission of Radiation'. The theory was first described by Albert Einstein (1879-1955) who paved the way for the development of the therapeutic laser. The first low level therapeutic laser was developed in 1962. By the end of the 1960's, Endre Mester in Hungary was reporting an improved healing of wounds through low level laser radiation. Since then, scientists and doctors around the world have been using laser light to treat conditions which can affect all age groups. LLLT is the application of red and near infrared light over injuries or wounds to improve soft tissue healing and relieve both acute and chronic pain. Low level therapy uses cold (sub-thermal) laser light energy to direct photo bio-stimulative light energy to the body's cells without injuring or damaging them in any way. The therapy is precise and accurate, offering a safe and effective treatment for a wide variety of conditions. The energy range of low level laser light lies between 1 and 500 mW (milliwatts), while the energy range for surgical lasers lies between 3,000 and 10,000 mW. When cells are exposed to photon energy, cellular charges are induced to change the cell homeostasis. This entails a cascade of reactions influencing a number of components of the respiratory chain. (i.e. cytochromes and cytochrome oxidase) which are the primary photo acceptors or chromophores, resulting in absorption of therapeutic wavelengths. This causes short term activation of the respiratory chain, leading to changes in redox status and in turn the activation of enhanced synthesis of ATP. The photons also affect hydrogen ion levels in the cell, in combination with increased ATP, affects the cell permeability and flow of sodium, potassium, and calcium. These changes are necessary to control the proliferative activity of the cell. Pain Relief: LLLT provides relief from acute and chronic pain conditions. Rapid Cell Growth: LLLT accelerates cellular reproduction and growth. Faster Wound Healing: LLLT stimulates fibroblast development and accelerates collagen and muscle synthesis in damaged tissue. Anti-Inflammatory Action: LLLT reduces swelling caused by bruising or inflammation of joints to provide enhanced joint mobility. Reduced Fibrous Tissue Formation: LLLT reduces the formation of scar tissue following tissue damage from cuts, scratches, burns and post-surgery. Increased Metabolic Activity: LLLT induces higher outputs of specific enzymes, greater oxygen and food particle loads for blood cells and thus greater production of the basic food source for cells, Adenosine Triphosphate (ATP). Increased Vascular Activity: LLLT induces temporary vasodilation increasing blood flow to damaged areas. Stimulated Nerve Function: Slow recovery of nerve function in damaged tissue can result in "dead" limbs or numb areas. LLLT speeds up the process of nerve cell reconnection to bring the numb areas "back to life". Immune System: LLLT enhances and stimulates the function of the immune system. Click here for researched and published article: "Tissue Healing and Low Level Laser"
Applications of LLLT technology have also been known to assist with the treatment of nicotine addiction as part of our Smoking Cessation, Stress Management and Weight Loss Programs offered at Advanced Healthcare.